In the current video, the „Parts Specialists“ Björn and Lars have plenty to do. This time, the two commercial vehicle mechanics take a truck from their own fleet apart and swap around 40 automotive parts of the brand DT Spare Parts. With a total of over 35 000 products in guaranteed quality from the complete range of the brand DT Spare Parts, vehicles are always reliable and safe on the road. 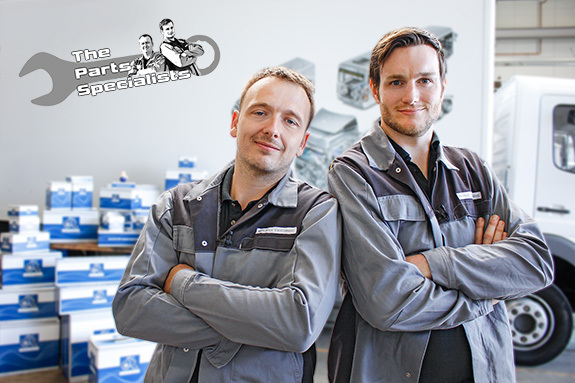 Watch Björn and Lars in the new video renewing for example the brakes and get useful tips that will help you to easily recognise the wear limit of a brake disk. While Björn exchanges the oil pump and shows where to pay attention during assembly, Lars demonstrates in the video how workshop professionals use the Partner Portal easily for finding the right spare parts for each repair. After a successful search, the required article can be ordered via DT distribution partners. Diesel Technic will gladly establish a contact to a distribution partner nearby – this is easily possible via a product request! The new video can be found under www.dt-web.tv and on YouTube. The videos of the Parts Specialists are a supplement to the multilingual, illustrated assembly instructions, which are already enclosed with more than 3 000 products and are available for download on the product detail pages on the freely accessible product search in the Partner Portal. For future videos of the Parts Specialists that support the everyday work in the workshop, topic suggestions and feedback can be submitted. Just send us an E-Mail at parts-specialists@dieseltechnic.com or share your ideas on Facebook. All benefits and service offers for workshop customers of the brand DT Spare Parts are summarized on the website http://benefits.dt-spareparts.com. The “Specialists info” newsletter informs regularly about news. You can sign up for the newsletter on http://newsletter.dt-spareparts.com by filling out the contact form.